Jekyll and Hyde the Musical was first staged in 1990 in Houston with a Broadway production following in 1995 which closed in 2001. Recently the show starting its second UK tour staring Marti Pellow. The show follows the story of Doctor Jekyll and his journey on exploring the duality of man, but with his experimenting he slowly phases out his Fiancée, Emma, and he takes on a new personality (Mr. Hyde) when taking the positions he makes. While he is Mr. Hyde he meets and falls for a prostitute, Lucy. The love triangle adds in some drama and passion which the original book didn't have and the score was also beautiful with a Les Miserables feel. Marti Pellow plays the title role of Doctor Henry Jekyll and Mr. Edward Hyde, he plays it very two dimensional with no chemistry with the other characters. When he played Jekyll he didn't pronounce his words properly and whether it was his fault or the sound system (it didn't affect anyone else) I don't know but I personally found it very hard to understand him, although when he turned into Hyde, I found his characterization very interesting and he played it very dark and mysterious which was fantastic. 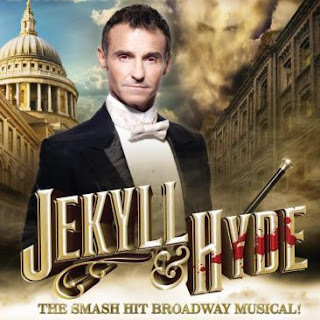 Marti Pellow played an average performance in the show, however Sarah Earnshaw and Sabrina Carter made up for this.Sarah Earns haw's Emma was sweet and innocent and Sabrina Carter's Lucy was feisty and very likable, both created a good contrast between them both and also with Jekyll and Hyde. Both the girls are incredibly talented and they were the perfect casting for this show, it was like the show was written for them. The rest of the cast were also great as whole the company. The production has been adapted for a UK tour absolutely brilliantly and I was very impressed with the quality of the show considering it is a touring production, but I can't help but think that the show lacked something. I can't put my finger on it but there was something that should have been there, but wasn't. The shows direction and choreography was wonderful and was exactly what I would want from this show. However I do feel that the British public are not ready for this show, maybe in the future but right now I think the thing bringing in audiences was the fact Marti Pellow stared in it, but I would love to see this show in the West End soon because I think it was a gorgeous piece of musical theatre and I would definitely recommend this show to everyone.